Coming Soon to MHS– Lighter Student Bookbags! Two disappointments related to books have accompanied our 1:1 computing program. The first is a hopeful fantasy– that books would be pre-loaded onto our laptops or iPads and included with the purchase of the device. Since traditional textbooks are notoriously expensive, I have never quite understood why one might presume the digital version would be “free”. But it is reasonable to hope that something made of bits and bytes would cost less than their print counterparts. The second disappointment is more grounded in reality– digital textbooks have to date been unavailable or inferior. The publishers have been incredibly slow to adapt to modernity. So the students have lugged their books around our school along with a fairly heavy laptop. The good news is that change is at hand. The Kindle, Nook and iPad have made digital reading for enjoyment commonplace. And the number of titles available for these devices has exploded. What’s more, consumers pay significantly less for the digital books. Finally, we are seeing many of our textbooks appear in outstanding digital formats (and for less cost than their print counterparts). With the iPad, it is easily imaginable that members of the class of 2016 will have significantly lightened those book bags by the time they graduate. Since we are in the midst of a sea change, a universal standard for texts has not been established. Parents will discover that some books might be available from Apple, Google, or Amazon, etc. Consequently, Mercy has resolved to be as helpful as possible under these circumstances. We are asking teachers to identify all available forms of their books to the the best of their abilities. Then we will publish this information for parents. Personally, I have a strong preference for my Kindle texts (which I read on my iPad). However, teachers like me will not be forcing our preferences on students and parents. We will give them the information and let them choose. 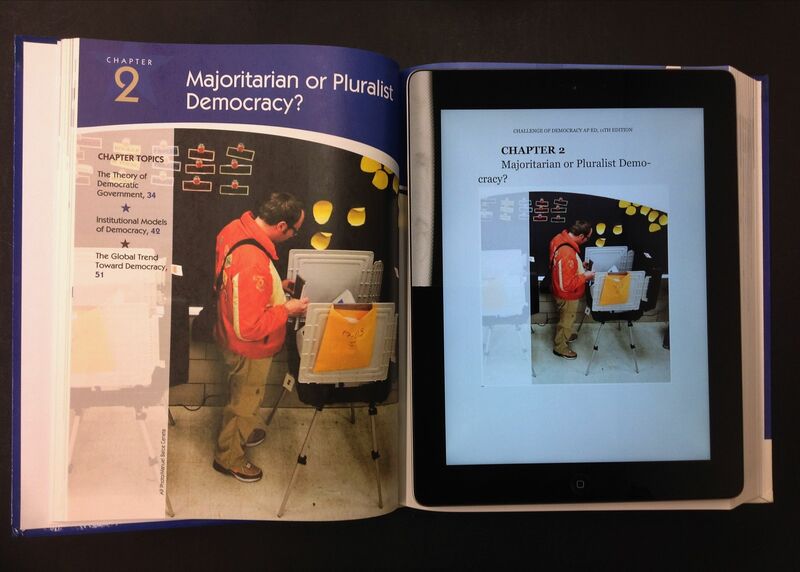 Traditional and iPad Kindle app versions of my 2012-13 text.